Same position as the morning 5.30 am IST ….. 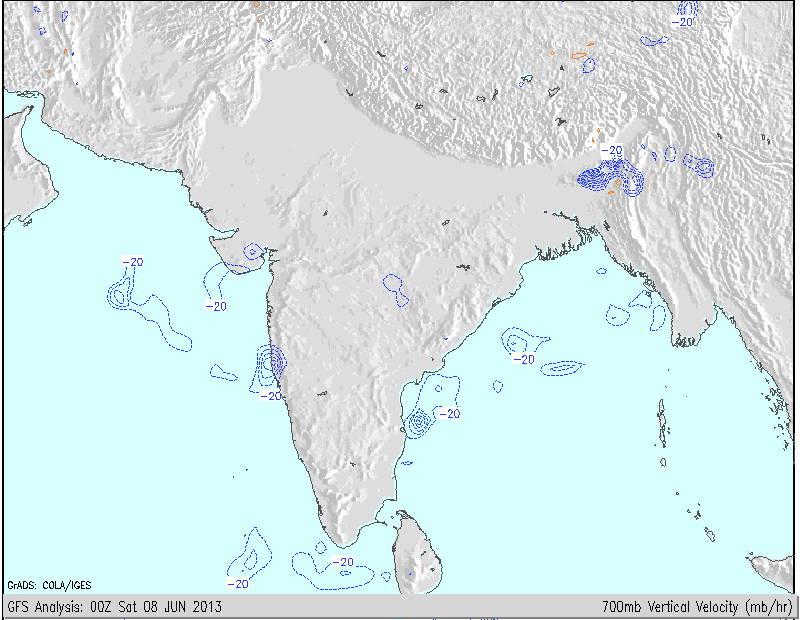 The off shore vortex is stagnant around the S.Konkan region as per the 1200 hrs Charts.. The upper air trough is persistently remaining in the “horizontal” position, and extends from the mid Arabian Sea UAC towards the vortex. Clouding seen is around the mid sea UAC and along the S.Konkan coast. It seems from the current conditions, that the UAC will dissolve, and the vortex will strengthen. It will possibly move a bit Northwards towards Central Konkan region by Sunday. In this circumstances, I could hold on to my Sunday forecast for Mumbai. Expecting around 65-85 mms in Mumbai (average) on Sunday. . By Sunday, with the vortex, the SWM could move Northwards towards Mumbai. Peak vortex location could get in excess of 150 mms on Sunday (Central and S.Konkan). As the vortex persists in the S.Konkan region, and the OLR not yet going below the 200 count, I would maintain the SWM at the same position as shown in the vagaries map (at S.Konkan). A trough in the 500-700 hpa region can form from the heat low over NW India. It could possibly form around the 14th/15th of June. This will be of extra benefit, as it will attract and pull moisture from the Arabian Sea into the NWI regions thru Gujarat. As this will be a low covering a fairly large area, from 14th/15th June, we could see the moisture flowing into Southern and Central Pakistan region also. The low in the upper regions will also attract the Easterly winds into Northern and NE India, from the Bay of Bengal. Later, maybe after the 15th June, as a result of the inter action of the Easterlies and SW winds from the Arabian Sea, we could see the SWM progressing into UP and then into Delhi NCR. Posted @ 1.30 pm IST Saturday: Anticipated Vortex at 700 hpa forms over South Konkan !! Mapped and Charted at 8.30 am IST Saturday..
Vagaries expects the vortex to get embedded in the off shore trough..more as it happens ! Fantastic Maharashtra rainfall amounts posted in comments by abhijit. Posted @11.30 pm Friday: A trough is getting stabilised at the 700 hpa level off the west coast of India. As anticipated earlier, the likelihood of an embedded vortex in the trough remains a possibility. Studying the wind shear and other factors, it seems the vortex can form as early as Sunday. The vortex, in all probability, can form anywhere between Dahanu and Goa on the west coast. The region and area of vortex may be small. But, we can expect >100 mms of rain on Sunday, or when the vortex forms. I think in south konkan places like Ratnagiri, Harnai could get more than 200 mm rain for next 48 hours. And Mumbai might get over 80 mm of rain on sunday and monday combined. svt: depends on the vortex formaton and position...lets see..
Till last year MCGM maintained this site (http://mumbaimonsoon.in/) with hourly updates of automatic rain gauges across Greater Mumbai. Now it shows the domain name expired on June 01 :|. How lazy is the municipal corporation! Any other source of getting these updates? Bright n sunny at the moment, Mumbai might experience similar weather today evening , thunderstorm possible. Sam Khanji - probably you agree now with Mumbai rains - multiples of 100mm (100x)? Rohit - Greenest city of India/largest planned city of world is "NAVI MUMBAI". Maximum number of dense canopy of trees of native species. Surrounded by western ghats, water falls like "Pandav Kada" similar to Jog falls, meadows, - golf courses,lakes, dense trees on all roads, gradens after blocks of houses, creeks, iconic -palm beach roads,forts,temples,parsik,kharghar hills,urban haat - center for cultural shows and now aiming to become "SILICON city of India" - IT Parks, data centeres, research institutes- greenery, all species, birds - close to hill station lonavala - just 30 minutes - Mumbai-pune heavy - NAVI MUMBAI is heaven on earth. Salute to architects CIDCO,NMMC,NMMT,MMRDA. I hope all other cities of India learn from NAVI MUMBAI. SCZ :64.8 mms , CLB : 53 mms .. So moderate amounts of rain received ..
Has Vortex formrd yet Rajesh? It seems it will form around ratnagiri and then move north towards Mumbai. Latest forecast model shows total of over 100 mm rain for Mumbai on sunday and monday. But ofcourse this forecast can change. Right Mr SSet , to get 100 mm rain in Mumbai per day is nothing new ,i only pointed out your extreme figures, 400mm, 500mm, 1000mm per day, no sun at all .these r not usual figures .i hope u understand what i meant . As mentioned by Rajesh sir, just a while ago the vortex has formed & as it makes its move towards Mumbai the rains likely to become more heavier and prolonged. Super darkness engulfs Navi Mumbai - seems rain gods will unleash all anger! Wondering if start is like this- what will happen in next few months? The offshore trough and the NW-E across the plains are in place. The heat wave, seasonal low, LWD have done their bit. And now the vortex! Is asking for more too much? Dark clouds have started gathering here at Vasai. as published by IMD just now - Thane Belapur - 140mm yesterday!! Guess it should be more as it was raining non-stop since afternoon - cold and dark. IMD monsoon on way to GUJARAT!! Too soon. By the way we see dense mass of clouds all prepared to hit Surashtra/Kutch? 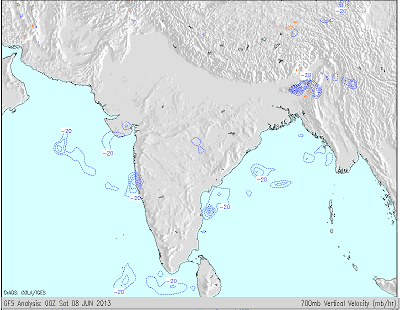 IMD in it's current bulletin has declared Monsoon over Mumbai, the Monsoon NLM now passes through Mumbai. Sset your take on Navi Mumbai is welcome. But don't discount the other heavens around Mumbai. Like Thane, where I stay for example. You are welcome to the planned godhbundar road area and see for yourself the greenery adjoining the SGNP. Also Thane is a well planned city like Navi Mumbai especially along the arterial belt from check naka to ovla on godhbundar road. You should have joined us in the April meeting to appreciate that. But anyways we will recommend to Rajesh sir to hold our next meeting at Navi Mumbai. No signs of rain today here in western suburbs. Raining non-stop since late evening in Belapur. Abijitji you are right thane area is very beautiful (recently I had been to essel world via Gorbhunder road - mountains,creeks,forests). It is steady downpour in panvel since 2-3 am. 3.am heavy showers in Vasai, now cloudy and breezy. Badlapur having just drizzling from 3am onward. @ SSET I am from Badlapur having beautiful Matheran mountain range running from Badlapur to Karjat in West direction. So in monsoon Kondeshwar waterfalls are famous one day picnic point here. And GSB sir is from Thane who stays at Ghodbunder and he requested you to visit an planned city Thane. Light to Moderate rain with intermittent heavy showers continuing at Vasai. Today morning had few showers & now Light to moderate showers started in dombivli. It's pouring in Vasai, for last 10 mins. At Mumbai ; currently heavy rainfall , completey dark ..
Raining continuously from 9 pm yesterday in all hues - very heavy ,heavy , moderate, light ,drizzle etc ..
latest update->very heavy rain at Mumbai for past 15-30 minutes with very low visibility..
4)Formation of a sympathy low along west coast in the off shore trough along with the above mentioned bay low.. Very heavy rains here in Thane . About 80 mm recorded on envirocon. And Abhijit I think SSET is very fond of you. Haha ,so now I am sure the next meeting you two should arrange either in Badlapur or Navi Mumbai. Torrential downpour at thane & dombivli.Thane got 82.6 mm of rainfall till now. Weather has become cool and pleasant ,as rains continue in Mumbai, Vasai and surrounding's. seems Rajesh sirs estimation will come true. Pouring like waterfalls in Navi Mumbai - no respite since yesterday. Probably this must be most vigourous pre-monsoon we ever had - and exceeds june month quota in just 3-4 days? IMD puts red alert over MAHA,GUJ,RAJ(extremely heavy rain for next few days). GUJ/RAJ are lucky gap between WD and SWM was too less are benefited by both. Meanwhile entire southern penisular India shows no cloud cover - indicating rapid axis shift towards north/central India. And what is the point of your constant comparison between Coastal Maharashtra/Gujarat and South Interior Peninsula? It is as pointless as comparing Cherrapunji with Mumbai. Hahahahahahahah, I know Avtansh which IMD SSET is talking about,( Imagination Mad department)from Navi Mummbai. Monday Rainfall till 5.30 pm IST for Mumbai: Scruz 88 mms, Vagaries 44 mms (from mid night), Colaba 18 mms. The way it rained today since morning I taught we would be close to 150mm. navi mumbai - belapur raining like roaring waterfalls - no sign of break since 2 days.